This is also the arrangement adopted on French official vehicles, where the standard has the colour of liberty (blue) to the fore on both sides. It's the Bugatti Chiron 110 ans Bugatti edition, celebrating the 110th anniversary of the storied French marque. This special edition is based on Sport version of the hypercar and will have limited run. Composite is used for manufacturing outer panels, front and aerodynamic elements. The special Chiron gets a body and front constructed from carbon fibre, finished in a matt "Steel Blue" (or should that be - narrows eyes, pouts lips - Blue Steel?) paintjob, along with exposed carbon fibre in steel blue carbon. She needs to be reminded of the historical Bugatti models. Matte black is also used for the car's exterior badging, rear spoiler, and exhaust tips. On the body side mirrors and the lower part of an electronically wing caused the French tricolor, Le Bleu-Blanc-Rouge. "With the limited Chiron Sport "110 ans Bugatti", we're ushering in the 110th anniversary of Bugatti's foundation". Inserts in doors and seats are made from Alcantara, and bluish skin tint which is called Bright French Racing Blue. The theme continues inside, too, where the tricolour adorns the "Deep Blue" headrests, steering wheel, and key chain. Instead of some clear nods to the old Type 10, Bugatti has turned the Chiron into a celebration of France, where Italian-born Ettore spent much of his life. Only 20 units will be made available in the market. As a finishing touch, there's a "specially crafted medallion" in the centre console storage bin, made from solid silver. Hence, it is powered with 8.0 liter quad-turbo W16 engine that offers an output of 1,479hp (1,500PS / 1,103kW) and 1,600Nm of peak torque. 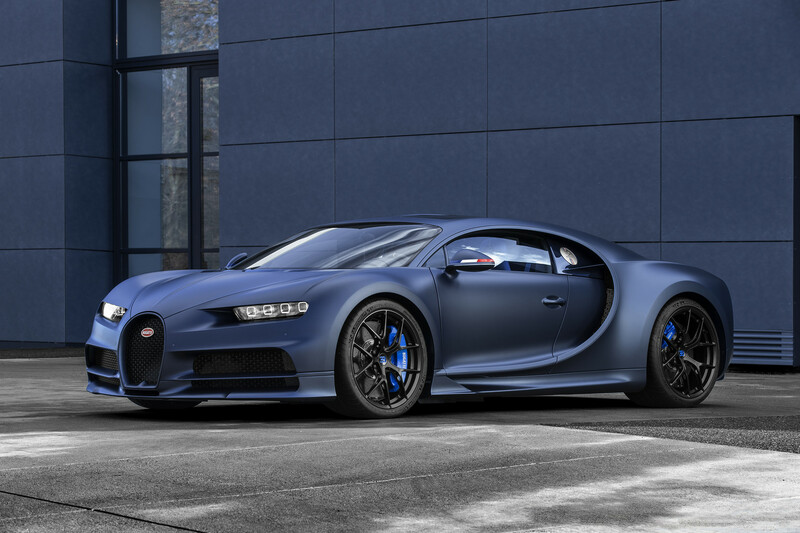 Bugatti quotes a 2.4-second 0-100km/h time, 6.1 second 0-200 and 13.1 sec 0-300, with a top speed of 420km/h. The special model celebrating the 110anniversary of the brand's existence in France keeps up this tradition.